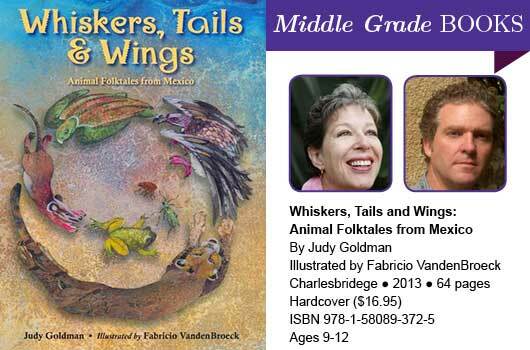 In this collection, Judy Goldman retells five folktales from the Tarahumara, Seri, Huichol, Triqui and Tseltal people of Mexico. The introduction shares information about these indigenous peoples, which are far lesser known than the country’s Aztec and Mayan cultures, but have nevertheless played an important role in its history. A map follows the table of contents to help readers follow each story’s location. The Tarahumara tale, When Señor Grillo Met Señor Puma, is about a cricket that is challenged by a Puma. The cricket outsmarts the Puma and prevails, and has since been singing his song every night at dusk. The Seri tale titled Mosni’s Search is a creation tale. The Huichol tale, Tlacuache’s Tail is a pourquoi tale that explains why opossums don’t have hair on their tails and how mankind got the gift of fire. The Triqui tale, Ouch! reveals that humans became productive beings with the help of fleas. The Tseltal tale, Pokok Up High describes how the buzzard was instrumental in making frogs’ bodies flat. A history of the indigenous people and cultural information follows each tale. A glossary of terms with pronunciation guides also accompanies each. The end of the book includes a very thorough bibliography with notes, followed by web resources for further study and an index with important terms and names. Award winning illustrator Fabricio VandenBroeck does an extraordinary job enhancing each of the tales with his beautiful acrylic and pastel illustrations that feature people wearing traditional garb. This is an exciting new collection of indigenous tales that covers little-known peoples of Mexico, and that children of all ages will enjoy.